The parents of a severely epileptic girl are set to march on Westminster to demand access to medical cannabis for their four-year-old epileptic daughter. 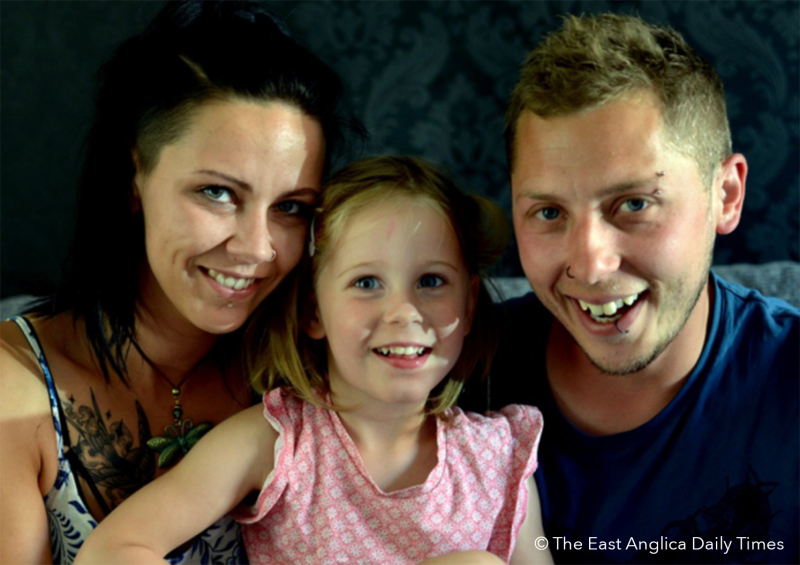 Anthony Clarry and Tannine Montgomery from Suffolk will lobby MPs after been denied legal, NHS funded, access to medical cannabis which has “massively improved” Indie-Rose’s condition. Indie-Rose, who suffers from Dravet syndrome, a drug-resistant form of epilepsy, currently has to rely on her parents bringing back cannabis oil illegally from Holland, costing her family £1,500 per month. has seen her seizures fall dramatically after using the oil, which is currently flown in illegally from Holland and costs £1,500 per month (18K a year!). Since beginning medical cannabis treatment, Indie-Rose’s seizures have dropped from nearly 50 a month to just 7. The evidence that the ‘illegal’ cannabis oil work clearly exists, yet doctors are refusing to grant legal access to the brave young girl. While cannabis was legalised for medicinal use by the Conservative Government in November 2018, allowing specialist doctors to prescribe pharmaceutical-grade cannabis oil, only a small handful of patients have been able to acquire a license. Even when patients are granted access, so far all of the prescriptions have been private, costing tens of thousands of pounds per year. Guidelines from the British Paediatric Neurology Association (BPNA) are the main reason desperate patients are unable to gain legal access to medical cannabis. The BPNA claim that THC can have a detrimental effect on a child’s developing brain, ignoring the very real fact that more children suffer brain damage through seizures than through exposure to THC. According to Indie-Rose’s mother, Tannine Montgomery, NHS trust doctors at West Suffolk Hospital in Bury St Edmunds and Addenbrooke’s Hospital in Cambridge have failed to prescribe the oil containing both CBD and THC, despite the oil being legalised since November 1. “Since using the oil, Indie’s condition has improved massively. “She has started living and is really enjoying her life. “She’s started going to Riverwalk School in Bury St Edmunds four-days-a-week and she absolutely loves it. “Her seizures have gone from about 40-50 a month to around 0-7. “National guidance stipulates that we cannot prescribe the CBD treatment Indie-Rose’s family is requesting. “National guidance also dictates that all CBD prescriptions should be completed by a specialist tertiary centre, rather than a district general hospital like ourselves. “We continue to help the family in the ways available to us, including making specialist referrals where required, backing their national license application, and offering to support individual funding requests. “As with any new medicine where there is a need to build the evidence base, the NHS’s normal medicines governance systems apply and are being used to support good clinical practice and safe and effective prescribing for patients whilst the evidence base continues to be developed. The only issue is that there are a very limited number of “specialists,” trained in the intricacies of cannabinoids and the Endocannabinoid System. There is only one specialist clinical centre in the UK, based in Manchester, which charges patients £200 just for a consultancy. Miss Montgomery defiantly said the family will continue to illegally bring medical cannabis in from Holland until they are able to obtain it legally in the UK. Cannabis laws in the UK are dangerously outdated. Countless studies have proven the medical efficacy of using cannabinoids to safely and effectively treat epilepsy in children, yet British children are being denied access (despite the UK being one of the world’s largest exporters of medical cannabis). How much longer will families of severely ill children have to wait before the Government grants them their right to a choice in safe, effective medication?